Back on August 31, Gene Stauffer found a very interesting shorebird at this very spot - the lushly vegetated Ellis Pond at Pickerington Ponds Metropark in eastern Franklin County. These wetlands have a long and storied history in Central Ohio, and many a great bird has been found at "Pick Ponds" over the years. I used to get my parents to take me to Pickerington Ponds long before I had a driver's license, as we were nearly always assured of finding interesting birds. Anyway, back to Gene's shorebird. Dr. Bernie Master and I headed over to Pickerington Ponds early yesterday morning, a gray and rainy day. In spite of the gloom weatherwise, we instantly found the bird - it stuck out like a sore thumb. Here's why it was easy to spot - the little wader is white as a sheet! Our bird picks about in the shallows, dwarfed by an immature Green Heron standing on the shore. Moving in a bit closer - although this shot is the best I could manage on this dark day with my 300 mm lens - and we clearly see a smallish sandpiper with moderately long bill and legs. The obvious "field mark" is that the bird is white! Since there are no naturally white sandpipers - at least to this degree - to be found around here, we know it must be a leucistic individual. And a strongly leucistic bird at that. Such unnaturally white birds are often referred to as albinos, or albinistic. True albino wild birds are very rare, and their chances of making it out of the nest are unlikely. Full-blown albinism causes such a weakening of their skeletal structure, feather shafts, and other essential parts that an albino probably won't last very long. Leucism is a genetic anomaly that also causes normally dark pigments to become washed out and whitened, and most of the "white" or piebald wild animals that are seen are leucistic. I've written in more detail about this HERE. 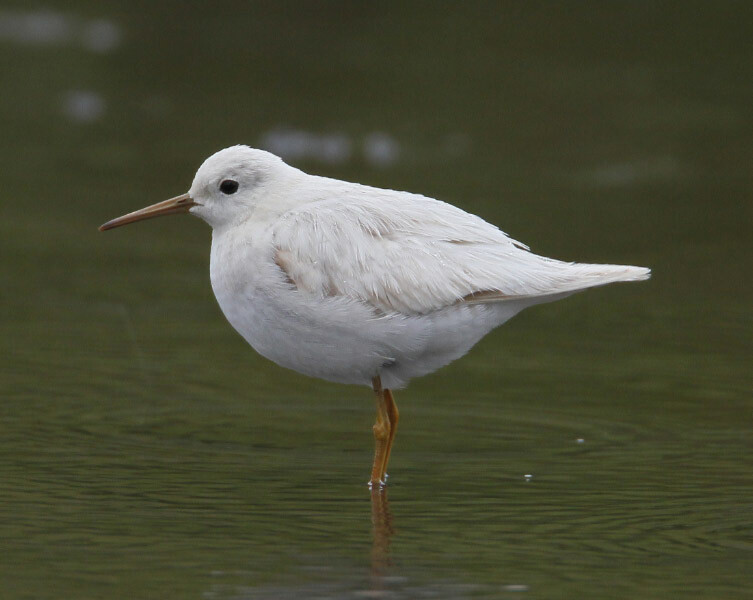 If you type "leucism" into this blog's search engine - upper left corner of the page - you'll find several other examples of leucistic birds. Bernie had some heavy artillery along - his 800 mm lens. And what a beautiful shot, in spite of the poor weather conditions. Now we can really see some details on this animal. Identifying strongly leucistic birds can be a challenge, as the coloration and pattern that can make ID simple on a normally pigmented specimen are obscured. The bill won't change, though, and we can see that this bird's bill is slender and straight. That's good for sandpipers in the genus Tringa, and especially Solitary Sandpiper, T. solitaria. Greater Yellowlegs would be much more massive, with a comparatively huge upturned bill. Lesser Yellowlegs would look closer to this bird, but it too would have a longer bill that should have a slightly upturned look. Both yellowlegs also have longer legs, giving them a loftier look. This bird's legs do look rather yellow. Solitary Sandpiper has greenish legs. I suspect that the anomalies associated with its leucism have created this effect. Note, too, the darker pigment at the bend of the wing (shoulders). That also makes sense for Solitary, as that's the most darkly pigmented area on a Solitary Sandpiper and consequently the least likely spot to be completely washed out and whitened. Also, faint vertical barring can be seen just fore of the undertail coverts - that's good for juvenile Solitary Sandpiper, and I do think this is a bird of the year. I made this short video of the bird, and it offers behaviorial clues to the bird's identification. Solitary Sandpipers are rather dainty nervous feeders, prone to frequent dips of the tail and rump. They tend to gracefully mince about, picking at the surface of the water - not the bull in a china shop raging about and head dunking that yellowlegs often engage in. Thanks to Gene Stauffer for bringing this beautiful oddity to light.